PROCESS SERVING LOCATIONS IN CANADA! PROCESS SERVING - We'll Serve You Better! 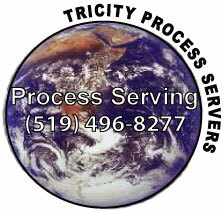 For your convenience Tri-City Process Servers have over 100 agents through out Canada that will provide you with professional services for all your process serving needs. Each of the offices we use are independently owned and operated by professional process servers. Leave the worry to us; one call to our Head Office will eliminate any frustration when trying to find the right people to serve your important court documents. We specialize in customer satisfaction. CALL TODAY! RATES & FEES CLICK HERE. Calgary, Camrose, Drumheller, Edmonton, Evansburg, Fort McMurray, Grande Prairie, Hinton, Lethbridge, Lloydminster, Medicine Hat, Peace River, Red Deer, St. Paul, Westlock, Wetaskiwin. Abbotsford, Castlegar, Campbell River, Chilliwack, Comox Valley, Dawson Creek, Kamloops, Kelowna, Nanaimo, Port Alberni, Prince George, Vancouver, Vernon, Williams Lake. Antigonish, Dartmouth, Halifax, New Glasgow, Truro. Barrie, Cambridge, Guelph, Hamilton, Huntsville, Kingston, Kitchener, London, Muskoka, Newmarket, Orilla, Ottawa, Owen Sound, Peterborough, Sarnia, Toronto, Waterloo, Windsor. Kerrobert, Prince Albert, Regina, Saskatoon, Swift Current, Watrous, Yorkton.